Price: Price depends on 2 materials. a.k.a. 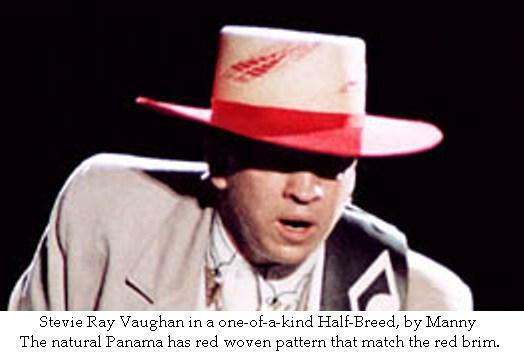 Half-Breed SRV- The same style as most of Stevie Ray Vaughan's hats, but with a straw crown for keeping cool in the summer and keeping your face protected by the brim. 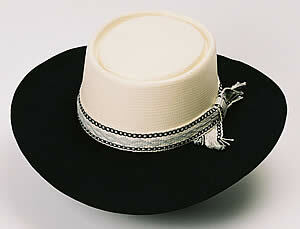 We have added the Requested Brim Width option. If you prefer the standard width, please just type in, "standard" or "as shown". If you type in a request that is not possible for the style you have chosen, we will contact you before proceeding with your order. Custom band must be ordered separately. 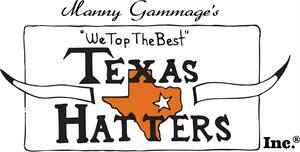 NOTICE: ALL OF THE HATS, AND MOST OF THE HATBANDS, ARE CUSTOM MADE AND WILL TAKE 2 TO 3 WEEKS TO MAKE. IF YOU NEED A HAT OR HATBAND FASTER, PLEASE CALL IN YOUR ORDER AND ASK ABOUT THE POSSIBILITY OF GETTING A "RUSH ORDER".